The Lifespans Soft Hip Implant* is designed to reduce painful post-surgical complications (e.g. excessive migration, cut-out, and varus collapse) following the repair of proximal femoral fractures in patients who have soft, low-density trabecular bone tissue. The Lifespans Soft Shoulder Implant* is designed to reduce painful post-surgical complications (e.g. excessive migration and cut-out of locking screws) following the repair of proximal humeral fractures in patients who have soft, low-density trabecular bone tissue. 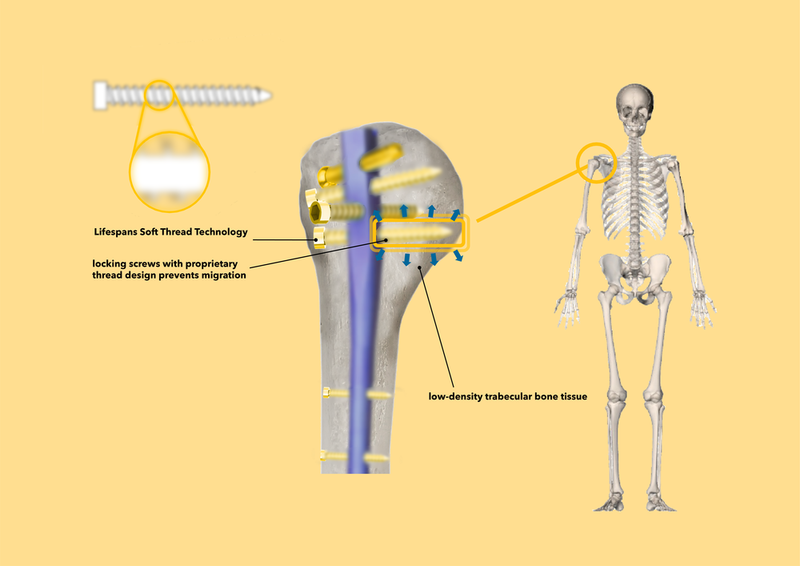 This unique implant features locking screws with our proprietary thread design (Lifespans Soft Thread), which has been shown to significantly reduce (by 10-20%) migration under loading conditions physiologically relevant to the forces commonly applied to fractured shoulders during the healing process (typically 6-9 months duration). The Lifespans Soft Spine Implant* is designed to reduce painful complications following spinal fusion surgery (e.g. excessive migration and cut-out of pedicle screws) in patients who have soft, low-density trabecular bone tissue.